(World, except North America) 9/14/09 cd. Illustrated script to "Bring Me The Head Of Ubu Roi"
The Radio Play of "Bring Me The Head Of Ubu Roi"
"The sound is a pure wonder. It envelops you. It gets into your head and won't let go. A musical earthquake." Mick Houghton, Uncut October 2009. "Reminiscent of Beefheart or Zappa's early sound collage, Lumpy Gravy." "The soundtrack to The Nightmare Before Christmas with lyrics by William Burroughs... yet another case of Pere Ubu charting a map of their own unique design." This album of songs is the centerpiece of a grand project, two years in the works, which is an adaptation of the Absurdist stage play that gave the band its name - Frenchman Alfred Jarry's "Ubu Roi" (King Ubu). The theatrical production based on these songs is called Bring Me The Head Of Ubu Roi. The concert version is called "Long Live Père Ubu!" - The Spectacle. "Long Live Père Ubu!" and selected out-takes are available as a digital download from Pere Ubu's own online "store" - hearpen.com, which is operated in partnership with Smog Veil. The cd is a Hearpen Records release (HR149) in the USA. Cooking Vinyl has simultaneously released it in the Rest Of The World. Portions recorded elsewhere by David Thomas, Dids and Michele Temple. Music for "The Story So Far" recorded at Harvest Moon, Milan OH. 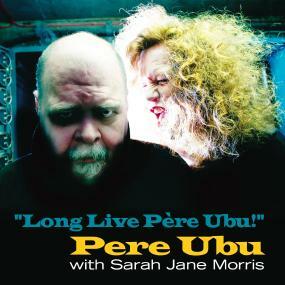 Front cover photo of Mère and Père Ubu by Angell. Live photos by Mark Mawston. Package design by John Thompson, www.idrome.net. Song 1 written by Moliné. Songs 2, 3, 4, 6 and 7 written by Thomas, arrangements by Mehlman - Moliné - Temple - Thomas - Wheeler. Songs 8, 9, 10 and 11 written by Mehlman - Moliné - Temple - Thomas - Wheeler. Song 5 written by Gagarin - Mehlman. Song 12 written by Mehlman - Temple. Song 13 written by Gagarin - Moliné - Thomas. All songs ©2009 Ubu Projex, administered by Cooking Vinyl Music in the ROW. All songs ©2009 Ubu Projex, administered by Bug Music in North America. Sarah Jane Morris - "Mère Ubu"